This article may help you, if solution from VMware Knowledge Base titled vCenter Server login fails with error: A general system error occurred: Authorize Exception not helps. C:\Program Files\VMware\Infrastructure\SSOServer\webapps\ims\WEB-INF\classes\krb5.conf contains wrong kdc entries. NB: Don't try to edit this file. It's automatically generated. To be honest - it was the most interesting issue for last couple of month. Mostly because any other issue I faced was already solved by someone else, so any problem was solved by following the obvious scenario: Problem -> logs - > google -> solution. Now I have to switch on my imagination, because all solutions for "Authorize Exception" problem suggested to re-join to AD and/or fix AD/DNS problems. So we spent several hours fixing non-existing problems. Well, we knew that Domain Controllers were changed, but we forgot completely about SSO, and nobody knew/remember that SSO uses it's own configuration (based on MIT kreberos) in order to bind to AD. But even when the problem was located, I've spent next couple hours examining SSO logs and trying to find where AD discovery configuration can be changed. It's a pity, that it's not possible to configure by some CLI (at least I didn't find anything). Hope this article helps. If so, I would appreciate if you consider to leave a comment. Thanks for posting this article, but I install VCENTER using SIMPLE INSTALL and never had to input a password for admin@system-domain. Now, when I go to install VMware Web Client, I get the option to key-in the password and no matter what I type it doesn't work :(. SSO is definitely installed because when I chose the option to install it separately it says wizard will uninstall it. Not sure if I should be un-installing it?? Have you tried with no (empty) password? Thanks for this! I've been pulling my hair out on this one for about a week now. Now if only I had remembered the SSO admin password, thankfully the possible list was short and I didn't have to call vmware. Thank you for your article ! After your tip, it resolves the problem ! Just a thanks for your article. I had tried the "official" method at http://kb.vmware.com/selfservice/microsites/search.do?language=en_US&cmd=displayKC&externalId=1015639 but it made no difference. Appreciate your comments. It inspires me to share more. Sign-on and Discovery Configuration is available only for the builtin account admin@System-Domain. Thank you for this! FWIW, editing the Identity Source was useless for me as well—I also had to purge the existing one and create a new one. That said, when creating a new one, clicking Test Connection always failed! The ONLY time Test Connection succeeded was after I clicked OK and the “re-Edited” the source. Same as Daniel. Tried to test it when making it and it failed. Saved anyway then edited and retested and it was ok. Thanks guys for this update! Thanks so much! This really helped me with my issue, I kept trying to edit the identity source with no luck. Deleting and creating a new source fixed things for me! Just to mention, we had similar issue symptoms and tried this fix without success intiially. It turned out that the Domain Controller certificate had expired (organisation not yet implemented auto-enrollment). It could be worth checking with your domain administrator if you find that re-adding the identity fails with a bind error. I'm having this same issue with no longer being able to sign into vsphere using domain account. The DC certificates had expired which I have since replaced, however I still get the Authorize Exception error. Rejoining the server did not help, I don't have the web client installed, but thinking that is my next step to attempt to resolve this. damn, followed alot of guidelines, but only this one works, nice man! There are some command line tools for this in the VMWare\Infrastructure\SSOServer\utils directory. Check out the ssocli.cmd configure-riat -a discover-is -u AdminAccount for finding a new domain. If you get real adventurous, you can also do a manual add of a domain through this method. Unfortunately, that doesn't solve my issue. The "Configure" area doesn't show up in the Web Client and those tools don't work. You are a lifesaver!!! Thanks! Awesome. You rock! This is exactly what I was looking for. Thanks a bunch. Thanks so much, this resolved an authentication problem we ran into when migrating our root certificate authority as well. Thank you very much for this information, it worked for me. VMware KB 1015639 should contain this information! Additionally, while trying to log in with the admin@system-domain account, I ran into another issue. After providing credentials, I received "Associated user's password is expired". This can be resolved, using VMware KB 2060150. Just had this exact same issue, except it was caused by the global catalogue being removed from a DC! Once we re-added all was fixed. 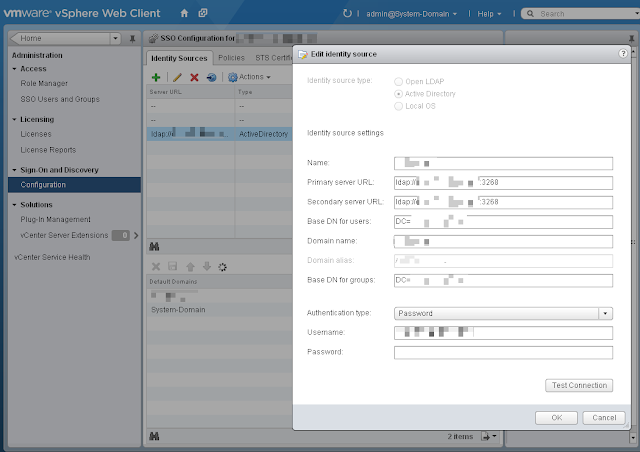 I added an entry into the host file on the vCenter and pointed the old dc to a valid dc and it worked.